This past weekend Liezl and I attempted our 2nd ever orienteering event. The first one we did back in October started disastrous. We planned a route and then decided in the last few minutes to change our route and follow the sequence Simon & Albert worked out. This was not a good move for as as we didn't have time to check where we should go and lost them. Needless to say we got lost and ended up giving up on one of the points. There were 2 things counting against us. We couldn't really read maps and I certainly was somewhat arrogant in my approach thinking I know the area like the back of my hand - clearly I didn't. In November I went on the MTB-Leadership course and had to suddenly read a map, I had to take a bearing and heard of the term hanger for the first time in my life. The knowledge from that course came in very handy as we decided which checkpoints we were going to aim for. We marked 11 and wrote down step-by-step instructions on how to get to each of them. We had our plan and we were going to stick to it. We had to start by 10:45 and we literally checked in whilst still making our own makeshift map holders by attaching the map with cable ties to our handlebars. The long hill up Hound House Road towards Pitch Hill was a rude awakening for our legs. We managed to pick up 4 checkpoints within 30 minutes. I started making calculations in my head whilst cycling up the dirt climb of Barry Knows Best and came to the realisation that if we manage to pick up our 11 points we will have an hour to spare which meant we could pick up more checkpoints. Liezl suggested that we think about that later once we had them all. I did have time to wrote down how to get an additional CP after the last one on our original plan. Everything went so well until after the 2nd single track CP. It was placed on one of the You should Goco's on Holmbury and what made it difficult was that you are not sure on which fire road you would be popping out onto on the map. We lost a bit of time on this one, but quickly realised our mistake, found the CP back at the top of the hill and carried on from there. One of the markers were placed on Tunnel of Love and thankfully we didn't go down it at our normal speed as we might've missed it completely! We picked up our 11 checkpoint in 1h40mins and had the potential to pick up another 3 points which were the closest to where we ended our original plan. To Liezl's dismay I started getting a bit competitive and excited so pushed for the extra 3 checkpoints. We picked up 2 of the 3 easily and we knew that the last one will be our biggest challenge for the day as this was in an area that neither of us knew really well AND we knew that a steep uphill would be between that CP and the finish. We now had 35 minutes left to find the last CP and be back at the Finish Line. We followed our noses for a bit as we were not sure if there were an actual route down to the checkpoint from where we were at the top of Greensand Lane as all we could see on the map was a footpath leading towards the CP which were placed on Alderbrook Copse. We were contemplating taking the footpath but when I saw how steep and overgrown it was I said no way am I going down there. Thankfully towards the right there was another path. We started following it, and before we knew it we were on quite a technical single track. We looked to our left where all we could see was these MASSIVE crazy big build jumps! We reached the bottom unharmed and quite pumped with our new discovery. We found the last checkpoint after some deliberation. Home time, the clock was ticking we had 20 minutes left. This last checkpoint was located on the back of Winterfold Hill down Greensand Lane, I am sure that to the roadies amongst us Barhatch Road will bring back some painful memories. Well that is where we had to go up! Liezl had her climbing legs on her where as for me my bus doors went open and it was a real slog! I asked Liezl if we could stay on the tarmac instead of going back via Supernova to the finish as I knew it would be quicker and less risky as by now my brain was fading. We arrived back at Peaslake Village Hall at 13:47 and got a 2 minute penalty which meant we would lose 20 points from our total. Our aim was to get 875 with our 11 checkpoints, with our additional 3 checkpoints we were now onto 1145 minus 20 penalty points and we ended finishing on 1125 out of 1760 that could've been won if you cleared the course! We thought that we might've been the first ladies team and our thoughts were confirmed. We won a helmet, cycling top, 2 pairs of shoes sponsored by Howard from Pedal and Spoke and also 1:2:1 coaching session with Rich from B1KE. Two years ago we had a skills session with him and we are looking forward to have another lesson with him. 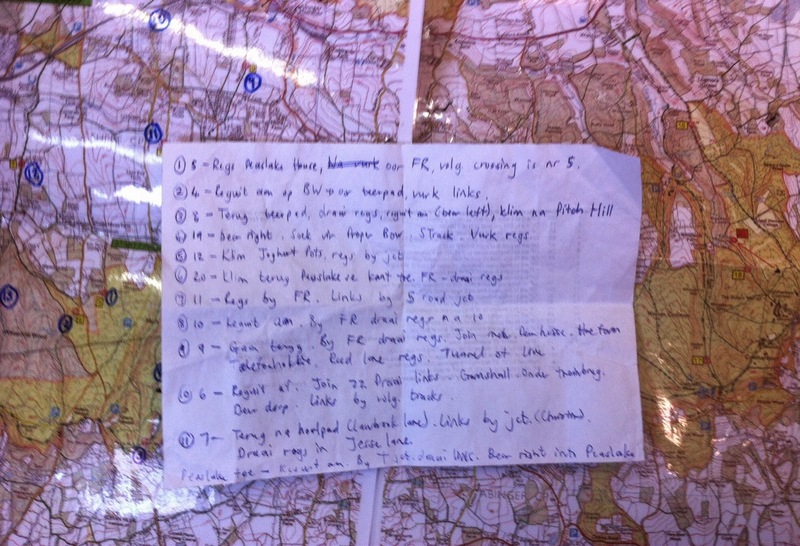 Strava file below in case you want to check out route planning skills. 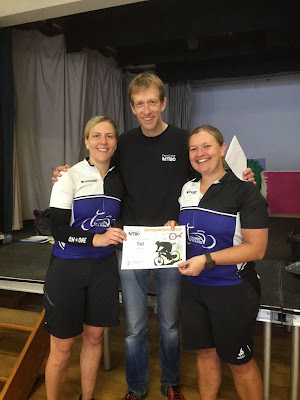 Next time we are going big... we might even venture over to Leith Hill. 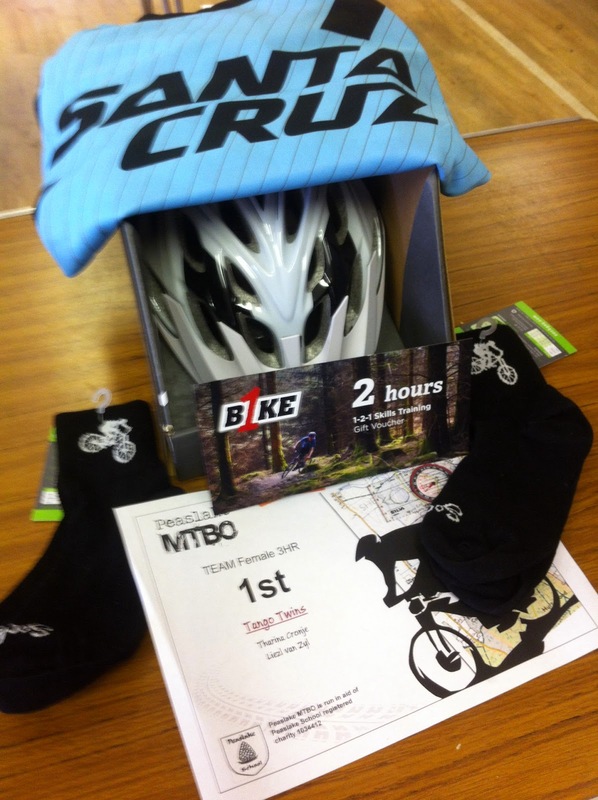 Thank you Peaslake MTBO for organising this local event we love supporting it. Our lovely prize - I still giggle when I read our Team name, Tango Twins, fondly given by Lizzie & Iain. The normal procedure for when we get back home. 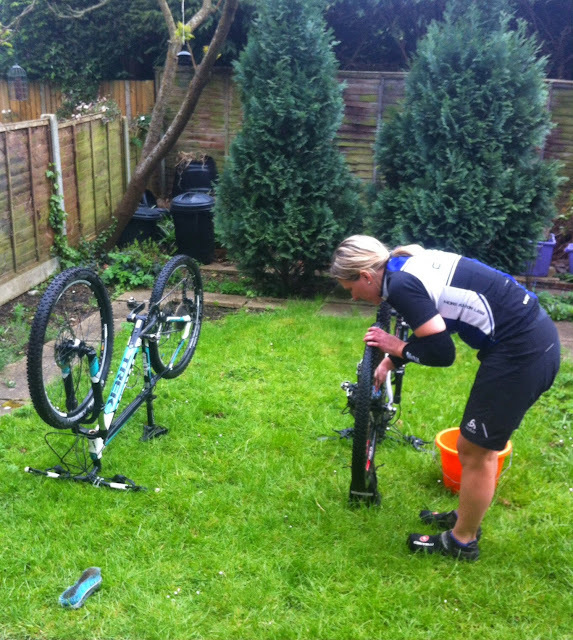 Bike wash and food! Directly translated from Afrikaans, "The one hand washes the other"
Good coffee seems to go hand in hand with cycling! Whether cyclists really love the taste of coffee or whether it is more of an excuse to take a break during a ride or to hang out after a ride I don't know. But my route planning often revolves around our coffee stop. 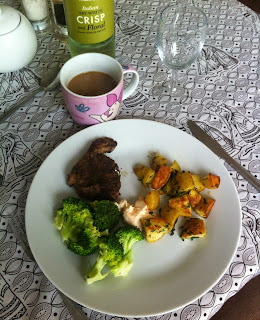 I learnt to drink strong Bialetti coffee from my good friend Kerryn when we lived together. I already had a deep love for strong coffee from my younger years, but Bialetti coffee took it to another level. Quite frankly put, I have become a coffeesnob! Last year my friends started fishing on what to get me for my birthday. Zane sent me reviews of the aeropress he raved about it. I was very apprehensive and asked, "Is the coffee hot enough, is it strong enough?" Anyway I think he got the message that TC doesn't like change and that I'm not really sure about this aeropress business. I am not very patient or have particular steady hands. Christiaan demonstrated how to use the aeropress and made me my first cup of aeropress coffee. The next morning I attempted it myself. You basically 'build' the coffee upside down. I put the vacuum in, added the coffee and then realised I would like to adjust the level of water I would like to add. I carefully pulled the vacuum down, the NEXT moment the whole vacuum popped out at the bottom which resulted in the mess below. #aerounimpress me! I'll need to add that I was on my way to work and that this mess was really NOT at a convenient time. I cleaned up and started the process again. Just as I added the hot water and screwed the filter on Kerryn walked in. I voiced my frustration and she said, "Move I'll make the coffee." 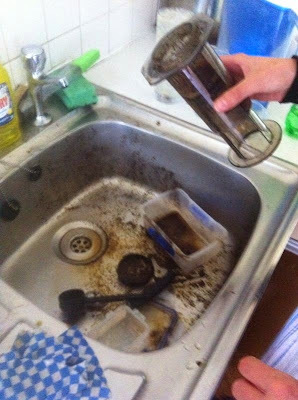 She took the aeropress from me and confidently turned it around over the sink AND off came the front filter bit. Disaster number 2!!! 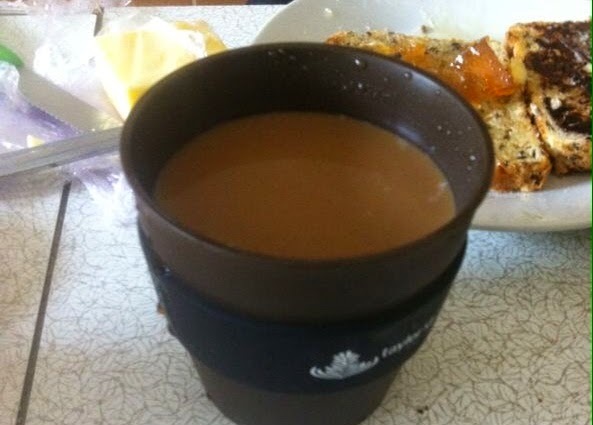 We took more care on our third attempt and finally we had a delicious cup of coffee despite that by the time I left the house the coffee was cold. 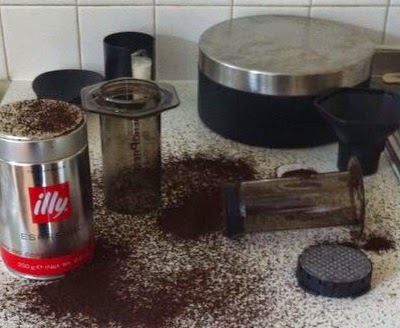 Since these disasters I have become more pro on how to handle the aeropress. I am also now a fan of the aeropress, but for a treat I still prefer the Bialetti! The aeropress is quicker than the Bialetti especially when you have guests. Aeropress coffee taste strong and is very smooth! 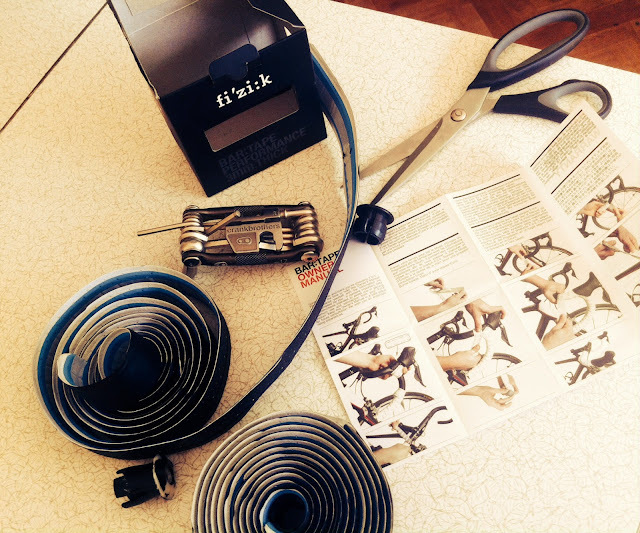 My 1st go at wrapping handlebar tape! I bought my roadbike from my housemate second hand so I had no choice in the colour. 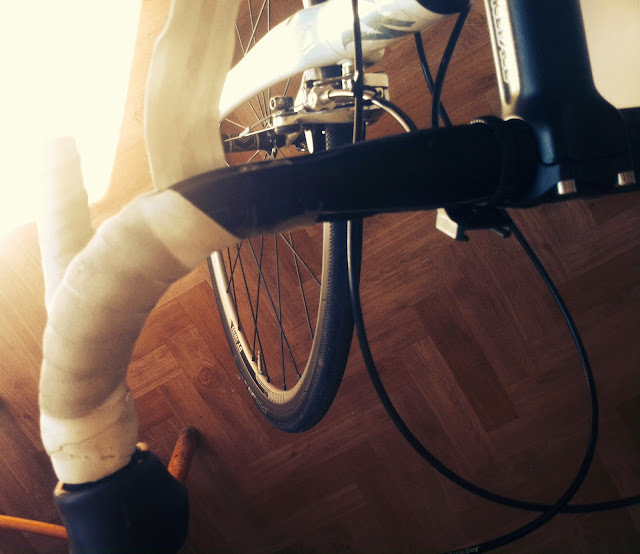 My bike is very white which looks beautiful but it is hard to keep the bar tape white and clean. 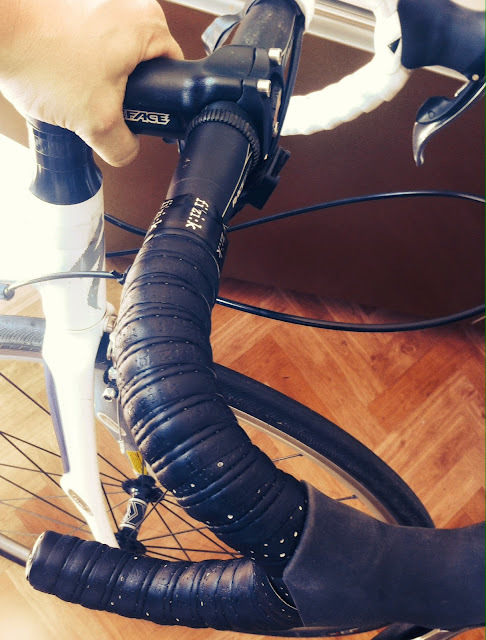 I replaced the very uncomfortable white saddle with a slick looking lightweight Specialized Ruby at the end of last year and have now finally made the plunge to buy new BLACK bar tape Gerhard van Niekerk recommended to me. Those of you that know me will know that I have the best intentions for taking on bike DIY, but they don't always work out as they should. Opening the brakefluid caliper instead of calibrating my brakes on my MTB , replacing my jockey wheels, but tightening them too much so the chain kept on bouncing around to mention only a few of my mishaps. I've been procrastinating this job for over a month. My biggest concern was how would I know where to divide the tape so that I have an equal amount for each side... Duh... I only realised once I opened the box that the manufacturer's did that for me! 2 rolls containing bar ends, a handy extra little piece for the hood and some tape to cover up the end was all rolled together. No mess, no fuss basically, all I had to do was roll the tape. With a simple search on Mr Google, I found this very helpful step-by-step written and video guide on how to do it. 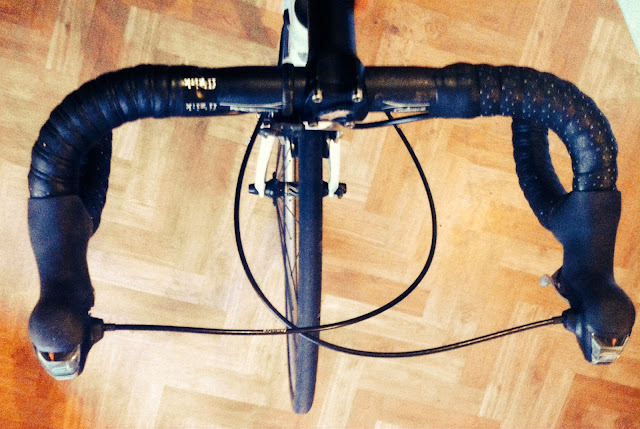 Thank you Road Cycling UK for the great instructions. Can I also just say that because I know myself too well, I made sure that I read and watched this before I start edas I really didn't want to mess up this job. All the ingredients for the task at hand... oh and electrical tape. Ta-dah right hand side done perfectly the first time! My friend came over for tea whilst I was doing the left handside so I did the 2nd side a little bit quicker. All looked fine until I came back from Waitrose, I noticed 2 bubbles. 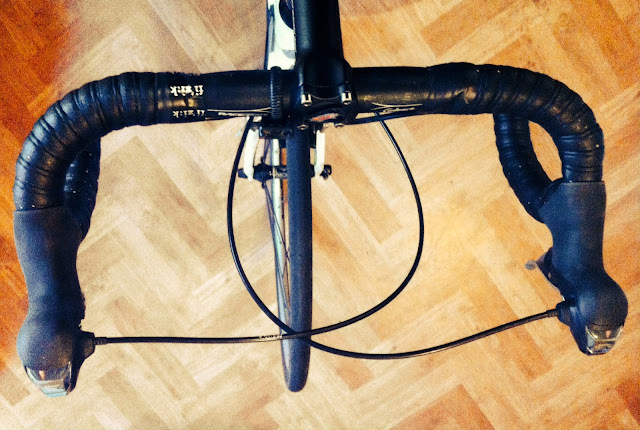 So I unwrapped everything again, did it really tightly and then ended up with perfectly wrapped handlebars only to then realise somehow I twisted the tape as I came over the hood onto the straight part and now had perfectly wrapped handlebars, but they looked slightly different. The BIG question was, would I be able to cope with the difference? Well the next photo is the answer to that very important question! The answer is NO, NO I couldn't deal with it. I'm well chuffed that I managed to do it even though it was a faff. I rode with it yesterday and it was all good!